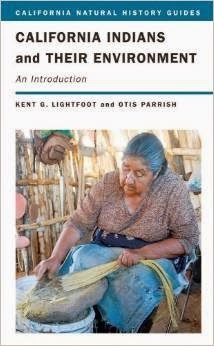 I recently bought a book called California Indians and Their Environment. California Indians unlike most of the other Indians in what is now the US had never developed any agricultural technologies. Instead, California Indians made their living exclusively off plants growing wild in their environment. However, Indians managed their environment by burning practices that encouraged their food and medicinal plants to thrive. Fire, an environmental management tool for the Indians was a threat to property for the Europeans. The use of fires intentionally set by the Indians, what are now called prescribed fires was outlawed by the Europeans. I imagine that the dwellings of Indians were subject to fire damage just like the dwellings of the Europeans but given that the Indians set fires to manage the vegetation in their territory did not build dwellings where they would get burned down. In addition, Indian dwelling may have been more temporary or movable and therefore more disposable or more easily relocated if a prescribed burn was called for. I have never seen the reasons for antipathy to fire spelled out anywhere in text, but the idea that fire is bad seems almost self evident probably at least in part because of a massive public relations campaign by the department of Agriculture. The appeals were mostly emotional and aimed at a population that probably had very little contact with forests on a day to day basis. The reasons for preventing forest fires are primarily economical and have little to do with ecological concerns. Fire is a natural phenomenon and ecosystems have adapted to fire and in many cases depend on fire to keep the ecosystem in balance. Not so in National Forests managed by the Department of Agriculture. National forests produce lumber. The lumber is sold to lumber companies and the Department of Agriculture collects money when the trees are cut down. Trees that go up in smoke don't produce any revenue and whether by training or by natural disposition, most people, myself included don't like the look of burned over forest. The National Park people on the other hand don't sell any lumber and so they can afford to let forest fires burn. No revenues are lost as a consequence. Perhaps park attendance goes down during a forest fire but quickly picks up again afterward. National parks even do prescribed burns since some trees like the giant Sequoias don't reproduce unless the ground is burned over. But back to the Department of Agriculture anti fire campaign. 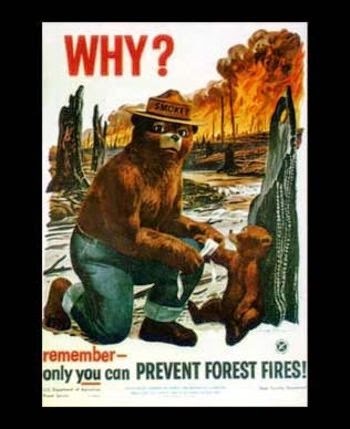 While the motivation to prevent forest fires was primarily financial, the advertising campaign instead focused on the fact that forest fires could potentially kill cute baby deer and bears, and so Smokey the Bear was created. 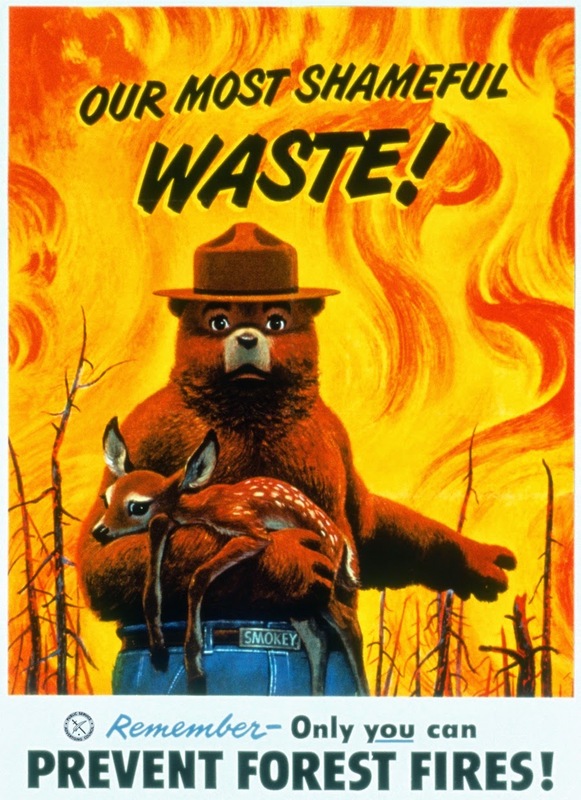 OK, so fire wastes resources, not to mention displacing or possibly orphaning young deer. Here's the orphaned deer theme again. no mention of wasted resources this time. And again, this time, who knows, might be Smokey's nephew that's getting bandaged up there. Smokey wants to know WHY? 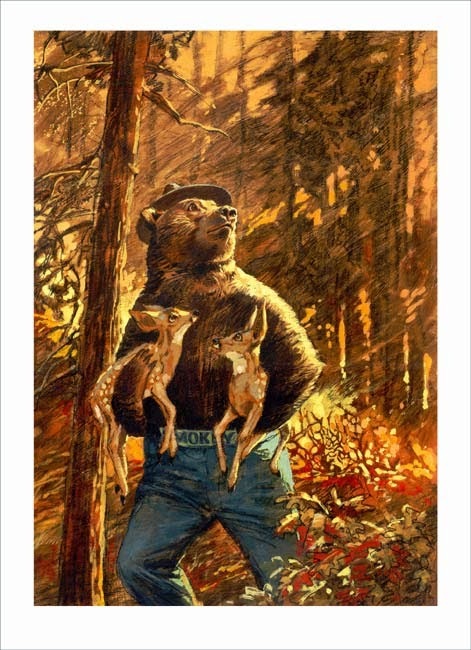 This time, no orphaned animals, but the implication is clearly that those two cubs would be in a heap of trouble if there were to be a fire. 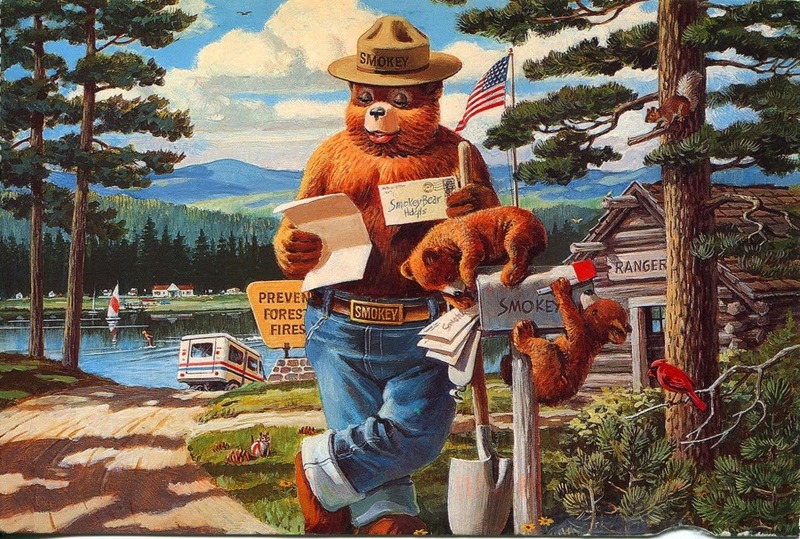 Smokey meanwhile is taking a break from shoveling dirt on top of camp fires to read a fan letter. In the background, city dwellers recreate on a lake in the woods at a forest service campground in an environment of statuesque ponderosas unmarred by fire. 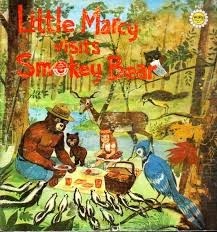 And for the children, a reminder that there's lots of critters that would be indisposed by forest fires, the advertising campaign bleeding out into the culture at large via children's books. 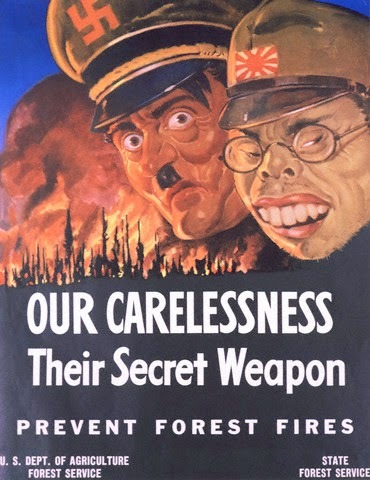 And finally, WWII poster. Needs an update there with Putin and Osama.